Caitilin de Beringy (onacloV's) PhD involved creating a multi-channel video installation, based on 67 interviews with the Australian Muslim community from 28 countries. 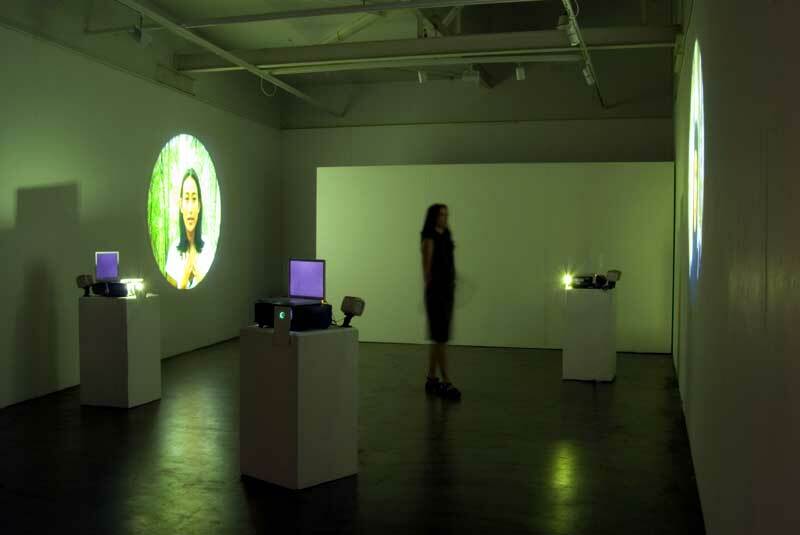 With the material, she created a three-channel video installation. The video was installed in gallery spaces using circular screens. Her aim was to explore how the genre of documentary transforms into installation via the processes of intertextuality and détournement. Outcomes include five exhibitions, two conference papers, three international journal publications and three grants. Two articles were published in the Canadian international journal, Hyperrhiz. This artwork was discussed at McGill University in Montreal, Canada, and led to an exhibition at the conference CTRL Bodies. 2016| Islamic Intertext, Screening, Hyperrhiz: New Media Cultures, Vancouver, Canada. 2007 | Islamic Intertext, ANCA, Canberra, Australia. 2006 | Islamic Intertext, Canberra Contemporary Art Space, Australia. 2006 | Islamic Intertext, National Museum of Australia, Australia.